The first weekend in March is usually reserved for the International Contemporary Artists’ Book Fair here in Leeds and this year was no exception. However, unlike previous years when it was held in Parkinson Court at the University of Leeds, this year it moved to the newly opened Tetley Centre for Contemporary Art and Learning. This was beneficial for the fair in a number of ways. 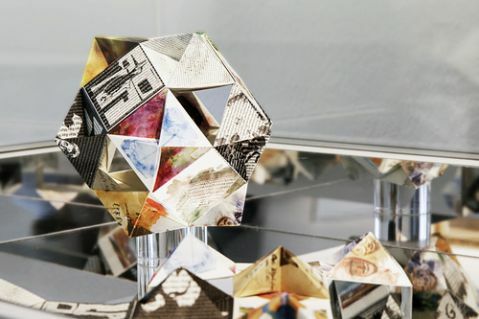 Firstly, many of the emerging artists’ book fairs in the UK and abroad are linked to contemporary art galleries, creating more of a critical context and audience for the work. Also, attempts in previous years to create visibility for fringe events and exhibitions around the book fair had always been quite difficult due to the locations being spread across the city. Having the fair situated inside The Tetley Gallery gave the opportunity to create a more cohesive collection of exhibitions. This year was also the first time I’d had hosted a stall on behalf of my own work, rather than as part of a group or collective. I usually see these events as more of a showcase for work, a chance to meet potential collaborators and discuss ideas, so it was a pleasant surprise to also sell a fair amount of work, taking over £90 in total. In particular, I had a very good response to one of my newest works ‘Moon Book’, which was developed as a kind of almanac, helping its owner to make decisions according to the phases of the moon. Despite its obvious fictitious status as a historical artefact, audiences at the book fair seemed to enjoy the interactive and hermetic qualities of the work which was reflected in sales. I was also pleased to find that one of the buyers was a collector for the Leeds College of Art Library, which means I have work in another public artist book collection. Alongside the fair and exhibitions there was also a rich programme of events, talks and performances. Although I had to look after my stall most of the time, I did manage to sneak off to a few things including the talk by Nicky Bird about her photographic practice, entitled Question for Seller. I found this work interesting on a number of levels. Firstly, the use of Ebay as a way of sourcing images and interacting with project participants established an interesting methodology for the creation (or co-creation) of collections. The ability to contact sellers through the online platform and integrate their responses into the work also evidenced new ways of generating content. Finally, the interrelation of online and offline in the production of art, (now referred to in some circles as Post-Internet), utilised a networked way of thinking, creating stronger connections between creator, audience(s), and participants. The transformation of the image from screen-based phenomenon to real life object and then back to digital facsimile also resonated with some of the ideas I’d been working with, particularly in relation to my Imaginary Museum curation project (from week 76) and my interest in the digitisation of museum and gallery collections as part of the Digital Humanities. The questions surrounding the ontology of each of these image-objects, identical though they may appear, are ones that seem to be coming to the forefront of my research and practice, so I’m interested to see where this leads in producing reproductions of my own work. The relationship between vitrines and institutional critique has inspired my latest collaborative project, ‘The Imaginary Museum’, a direct reference to the Andre Malraux publication ‘Museum without Walls’ (discussed in week 60). Under the auspices of the Artist Book Collective, I invited artists to submit new or existing images relating to the idea of the museum or archive. Each of the selected images was produced as a multiple edition A6 postcard to create a collection of 18 different images. Responses to the brief could include taxonomies, museum methods and display, exhibition plans or blueprints and the role of photography as archival material. The work was due to be shown as part of a series of exhibitions in conjunction with the International Contemporary Artists’ Book Fair at The Tetley, Leeds, opening on 7th March and continuing till 26th March. In the first instance I had intended to produce simple postcard holders or shelves to display the works but after a discussion with the technician about the participatory nature of the exhibition, it was decided that a custom designed shelf with tray inserts would create a sleeker look to the installation and would also be much easier to manage. The shelf (shown in the image above) thus became an integral part of the work and a potential vehicle for future collaborations on a similar theme. Another element of the work was the addition of a nearby honesty box with a small notice asking for a discretionary donation of 50p per postcard, which was intended to inscribe an element of value in the work and ensure that people gave more thought to the works that they chose. Any money raised from the exhibition was to be split between the artists involved, creating a connection between the purchase of the works and the artists’ labour. It was encouraging to see audience interactions with the work and receive feedback from invigilators, who reported that there had been discussions between groups of visitors in deciding why they were choosing one particular image over another. Equally, the honesty box proved to be successful, taking £150 over the course of the exhibition. This element of ‘donation’ rather than ‘price’ added another unconsidered element to the work, that of gift, where interactions between myself as curator, the artists and the audience became a kind of gift-cycle. After splitting the donations between the artists, each payment came to a total of £8.34 each. Due to this factor, and the wish to create a legacy to the project, it was decided to offer the artists another option; either to take their share of the donations as agreed, or to contribute it to the production of a catalogue/artist book of the project documenting both the work and the images, in return for two copies of the publication. Thankfully, most of the artists were interested in this option, and the publication is in progress. Artists involved in the project were: Alice Bradshaw (Museum of Contemporary Rubbish: HOARD), Amelia Crouch (Untitled: Primitive Physic), Charlotte Victoria Furness (The Bad Faeroes Tooth Collection Kit), Chris Taylor (Family Archive), Emilio Macchia (Bits & Pieces – Charles Nypels Archive), Heather Chou (The Whitworth), Jeni McConnell (Thirty Instruments), Joanna Brown (Twentyeight Fingers), Jon Eland (Reconstructed), Kate Morrell (Animal, Vegetable, Mineral? ), Katya Robin (Bucket List), Laurie Woodruff (Trivialogue), Louise Tett (Accretion), Manya Doñaque (Museum of the Senses and Non-Archivable Material), Richard Shields (Attendance Figure), Silvie Fisch (Lake Treasures), Theresa Easton (Two Thousand Insects), and Trevor Borg (Landline). The anthology ‘Institutional Critique; An Anthology of Artists’ Writings’ edited by Alexander Alberro and Blake Stimson provides a historical overview of the genre, reflecting the scope of practice over four decades, from the late 60s through to the present day. Despite their acknowledgement of a potential institutionalising of institutional critique, Alberro and Stimson’s selection aims to highlight the artists who were most influential within the field, whilst also including previously unpublished works. The earliest incarnation of Institution Critique yielded various artist manifestos, pamphlets, falsified passes for free entry into exhibitions, sit-ins and boycotts which aimed to disrupt the business of dominant institutions. A particular strategy of the time was non-compliance with the gallery system, where artists such as Eduardo Favario and Daniel Buren closed the gallery for the duration of their exhibition in the late 1960s, while Julio Le Parc and Enzo Mari withdrew from the large scale international festival Documenta IV. My recent explorations of the connections between art and anthropology within the context of the museum have led me to begin producing wooden vitrines and cabinets to house my work. These cabinets take the form of shelving units or compartments which are designed in tandem with the objects to be displayed, as an element of the finished work. This seems to give the items, which are often paper-based, the illusion of longevity, often afforded by museums. However, unlike traditional vitrines and museum cabinets, I am not just interested in preserving items collected from my practice, but in engaging the audience to interact with the objects, or to build new interactive elements directly into the cabinets. In this way, the work becomes an anthropological museum of art practice, as well as an ongoing relational experiment in which the audience are invited to become active participants. 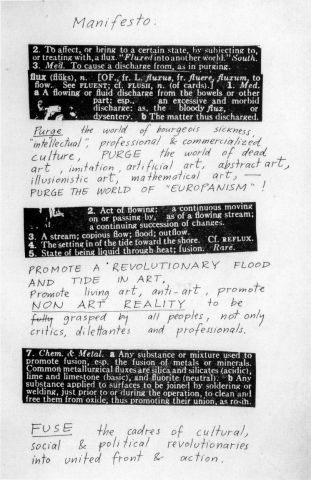 Similar collections of artistic practice have been created previously, most notably by the Fluxus collective of the 1960 and 70s. 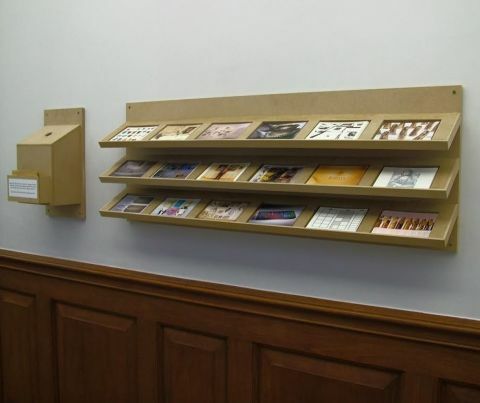 James Trainor’s account of The Flux Cabinet in The Museum as Muse: Artists Reflect details the accumulated practice of the Fluxus group under the leadership of group founder George Maciunas. Before producing the final Flux Cabinet, Maciunas produced various different versions of anthologies, according to his interests in functional architecture and furniture design:“The first anthology, Fluxus Year Box I (1963), was an edition of wood boxes containing musical scores, handbills of “Fluxevents”, conceptual pieces, diminutive objects, photographs, and pull-outs of various kinds… The Fluxkits (1964-65 to the late 1960s) represented an intermediate stage between the Year Boxes and the Fluxus Cabinet of 1975-77 [and] took the form of attache cases, with the contents varying widely from copy to copy.” (Trainor, 1999, 83). Anthologizing the works in this way, not only gave the the Fluxus group agency over the way that their oeuvre would be seen by future generations, but it also seemed akin to a type of anthropological practice, where objects were displayed in the contexts of their use, maker and networks. This perhaps differs from more ‘traditional’ forms of anthropology, given that the collators of the work were the artists themselves, and the works were not ‘living’ objects, but were instead multiples produced for the purpose of display, or documents/scores relating to more ephemeral artworks and performances. Of course the irony of creating an archive of tactile and participatory works is that as soon as it gains ‘Artworld’ value, the works included are no longer accessible in the ways for which they were designed. This begs the question, is it possible to create a ‘living’ anthropology of objects?